I have had the photos for this post edited and ready for several days and I have no excuse for only now posting except that I suddenly needed to rearrange my desk and sewing area. It went well and I am almost done despite Autumn and Mike having doubts about my ability to plow through the insane mess I made! All that is behind me now, so I can finally write! 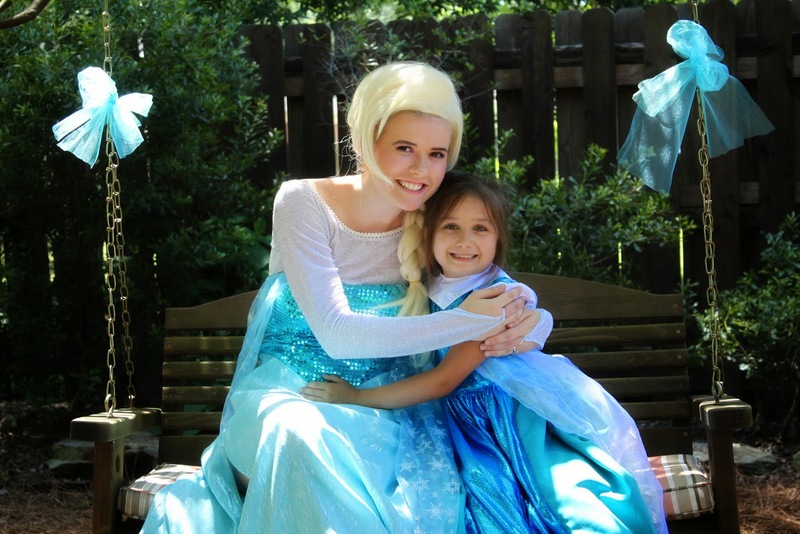 This is part 2 of Autumn's Summer Frozen Party and we're headed outdoors! I don't think I mentioned this here, but we had the family garage sale in Mike's parents' neighborhood back in April. Mike's dad decided to sell the sofa because Lainey has been wanting a new one. She...wasn't exactly expecting to come home to her sofa outside with a sold sign on it! They made it work, though, and moved the screened-in porch furniture into the living room. It worked out for me because there was enough room to put this table in there for the kids to eat on and do their craft. You can't see them in this photo but by the bigger table there are also smaller kid-sized picnic tables Lainey has for when the whole family is here. Lindsay and Lauren made this room look good! 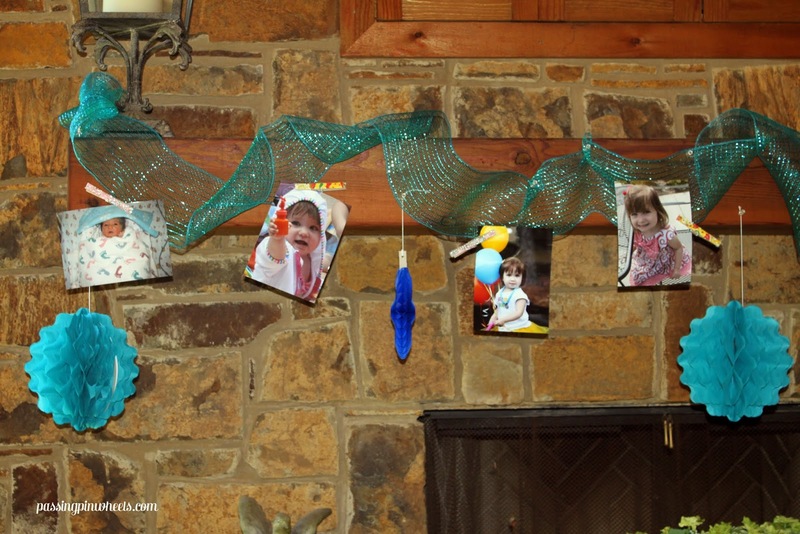 I didn't even think about putting anything on the mantle but I had some tulle and deco mesh so they got to work. I wasn't sure what to do with the photos of Autumn, one from every May since she was born, but this turned out perfectly! The clothespins came from Autumn's roadside bulletin board and I got the hanging paper things from Walmart and a couple of party stores, mostly on sale which was nice and an advantage of planning for a long time. They aren't in this photo, but I also put mason jars filled with yellow flowers on the mantle. We didn't go crazy in the outdoor kitchen area. 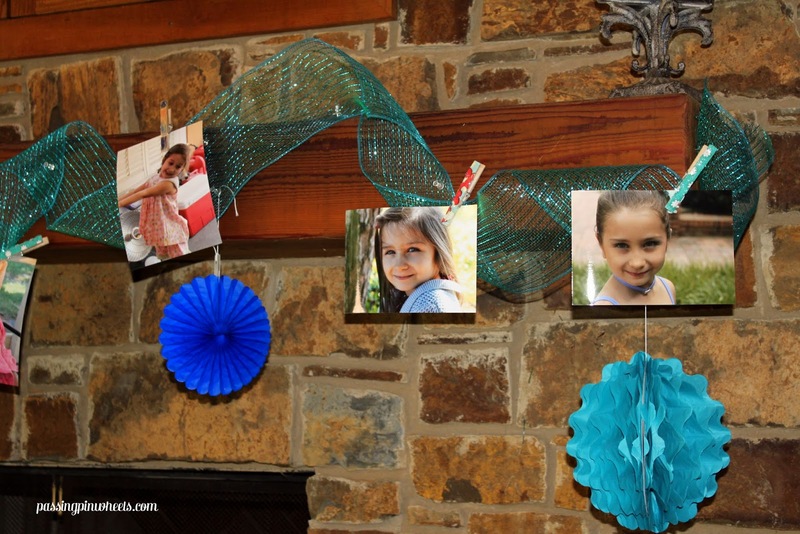 Pd hung these pretty paper poofs I found at Hobby Lobby, Lainey already had the candles, and I added the flowers. I bought one bouquet of yellow flowers at Costco on a whim and they seriously brightened everything up. Lainey and Pd provided the food, hot dogs, and sliders. Great for the big crowd! Since the food was simple, I didn't do tent cards for the buffet. 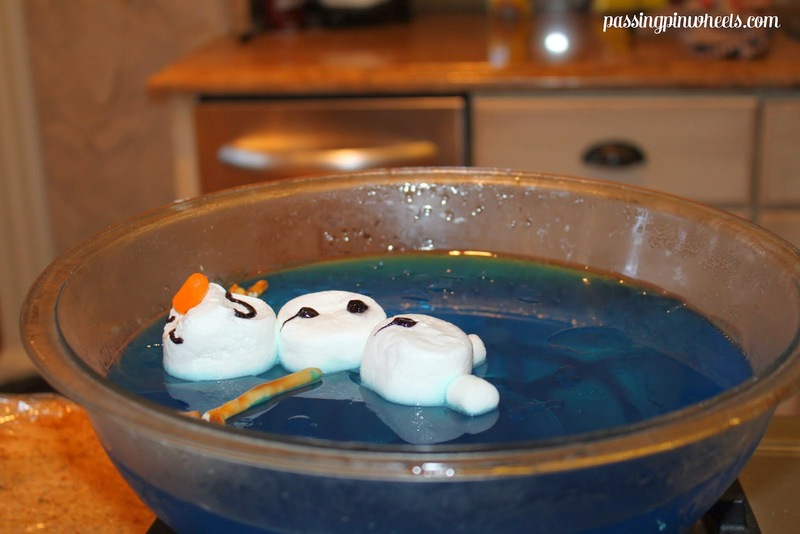 I did make an Olaf in jello thing but the one on Pinterest was so much better than mine. Olaf might have been a little better if the plastic I covered the bowl with didn't stick to his button icing and smash his nose. It wasn't really worth buying the ingredients to do this one project but I think if I hadn't tried I would have been a little sad. Although I'm a mediocre marshmallow artist, he still looked pretty cute up on the bar. Because of the In Summer song, I wanted to do a picnic look for the outside. When I got lucky and the cake figurines were in stock at the Disney Store, I also picked up Hula Olaf. He's in my car now! Autumn made the sail boat some time ago as a Kiwi Crate project. 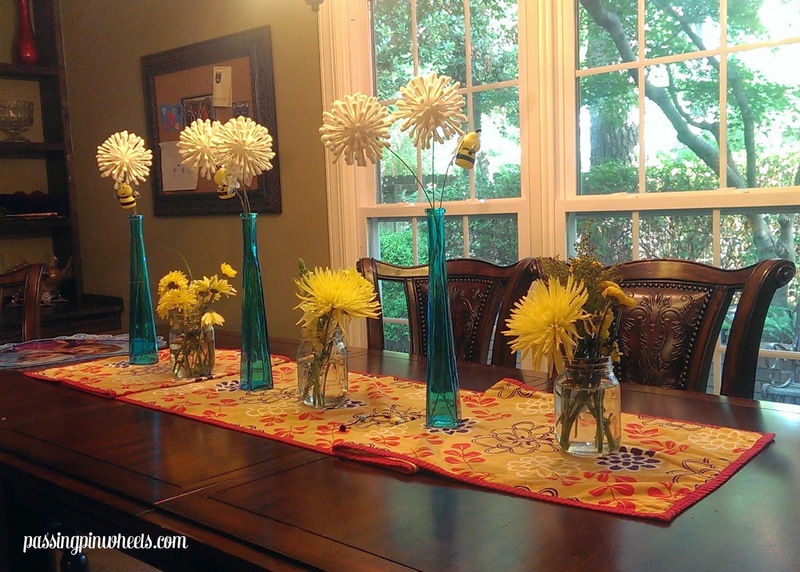 The place mats are paper ones I saw at several party stores and I found the blue vases at Michael's on clearance. 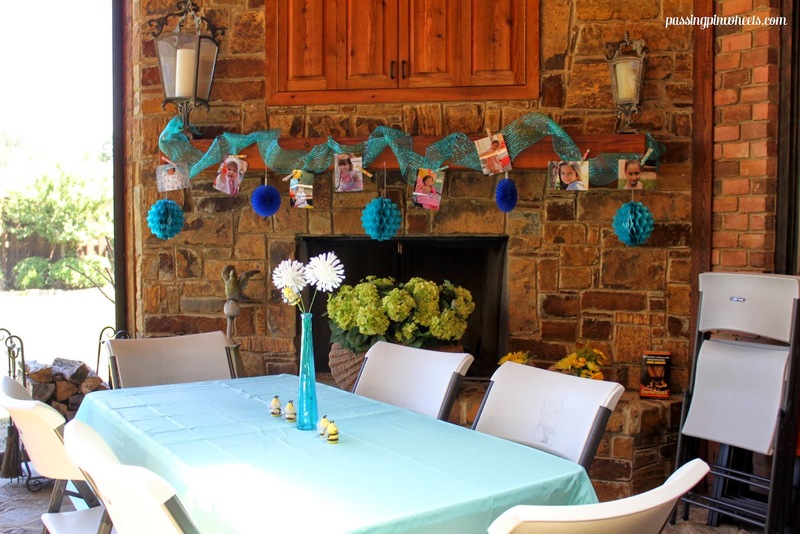 I thought they would tie the theme to the inside of the house, along with the blue tablecloth on (in?) the screened-in porch. I made the dandelions AND I LOVE THEM SO MUCH. I love them so much that all of this is on my breakfast room table right now! Sorry about the picture quality on this one. I took it with my phone. 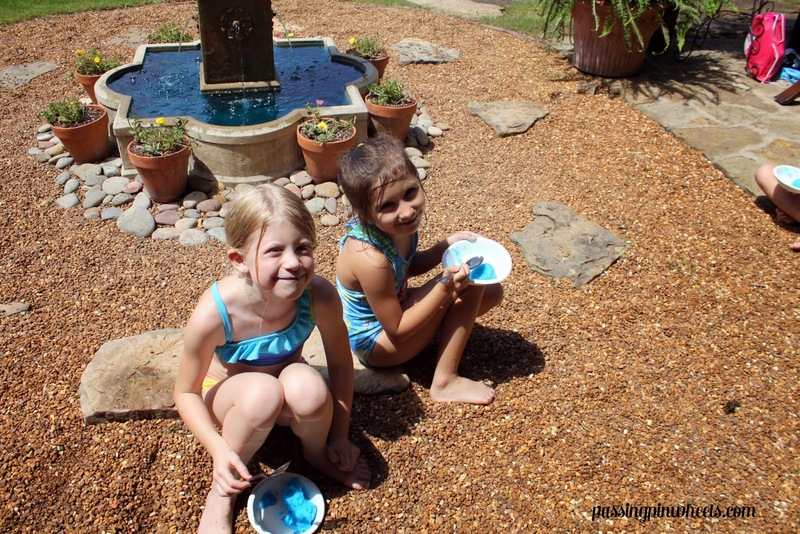 If you would like to make your own dandelions, I used this tutorial and skipped the dying step. Also, instead of using stems from inexpensive flowers, I used floral stem wire. I also wrapped the stem wire around the bee wings (the bees are from Oriental Trading) and it held them up perfectly well despite my initial concerns. Even Pd got into the spirit, he dyed the fountain water blue!! Too fun! I just realized that I took this photo before I finished the punch--at this point only the lemonade is in there. 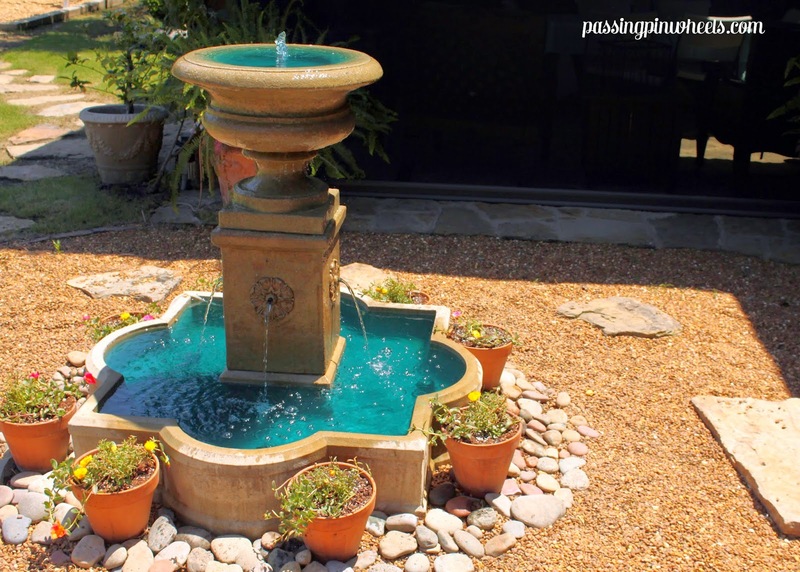 Like the fountain, the punch was blue. And, you can see one of the two tent cards I made. The other one was with the candy to tell people to please fill their bag. Autumn won't drink carbonation which isn't necessarily a bad thing but it did put a stop to the sprite-based punches I was pinning. 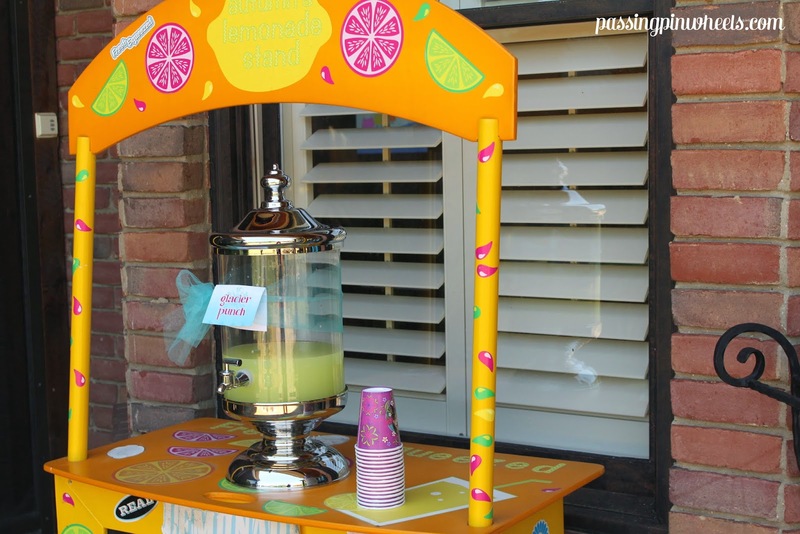 I found this recipe for Tiffany punch, though, and the kids loved it. The grownups loved it. I highly recommend it for your next party requiring a blue sugary drink. We put the other drinks over on the cart but it appears I forgot to take a picture of that! We didn't do anything special other than putting out blue cups and napkins. 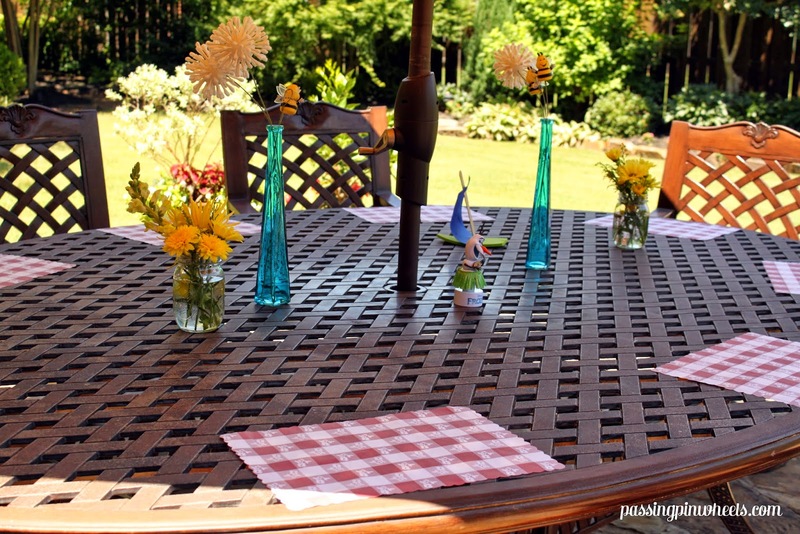 Oh, and for the outdoor meal, we used plain white plates with blue napkins in keeping with the picnic theme. Which brings us to the special guest! We had the kids wait at this cool wall that Mike's parents have and snuck Elsa in through the back. At first the kids were all, "whaaaat?" And then they started to grin. I had to prompt Autumn but once she made it over to Elsa, Autumn never left her side. Autumn has a wide range of friends and our party was an even mix of boys and girls. You know I'm pretty gender neutral in my approach to parties and people in general but I did wonder how a princess (queen, really) at the party (as opposed to a Princess Party which I don't think this was) would go over. It was fine. Perfect, in fact. It reminded me of the end of the school year party. The room mom included Let it Go in the year's slideshow. The boys all groaned. Covered their ears. Then, one boy in front of me started singing passionately into the ear of the boy next to him and then ALL THE KIDS were belting out the songs like an 80's hair band with a power ballad. LOVE IT. 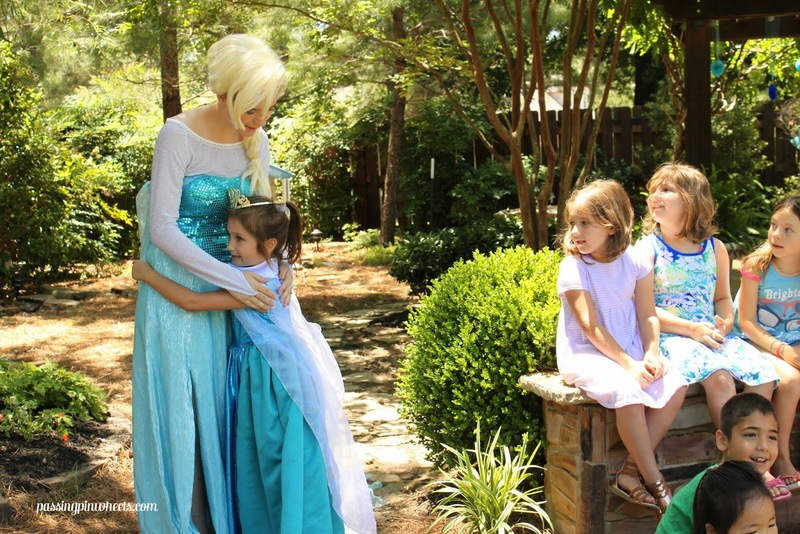 We took a few group photos and then headed over to the arbor where Elsa read A Sister More Like Me to the kids. It was a cute book! 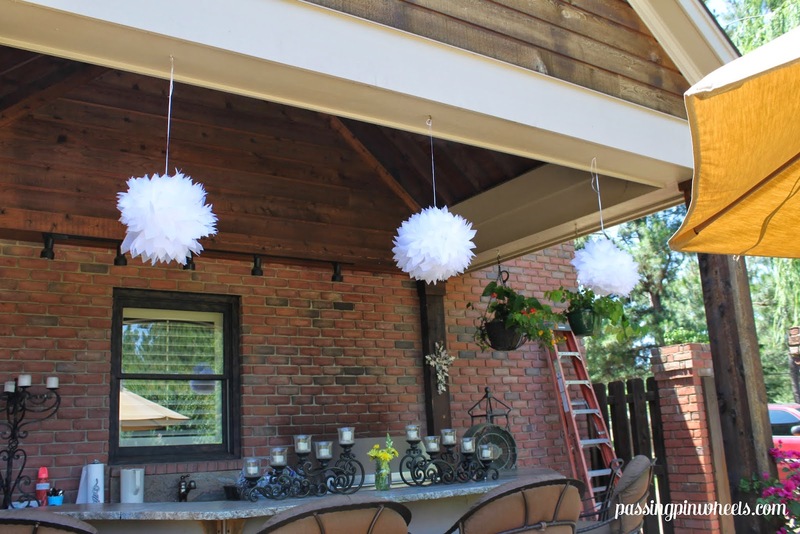 We used the same paper fans from the porch in the arbor and I tied some tulle bows to the swing. I also put out a red checked picnic blanket to go with the outdoor theme. Before Elsa left, the kids took pictures with her here and it turned out adorably. In fact, it was one of the boys who reminded me that we hadn't taken our individual photos with Elsa! After the book, the kids headed over to the porch to do an Olaf beach globe. 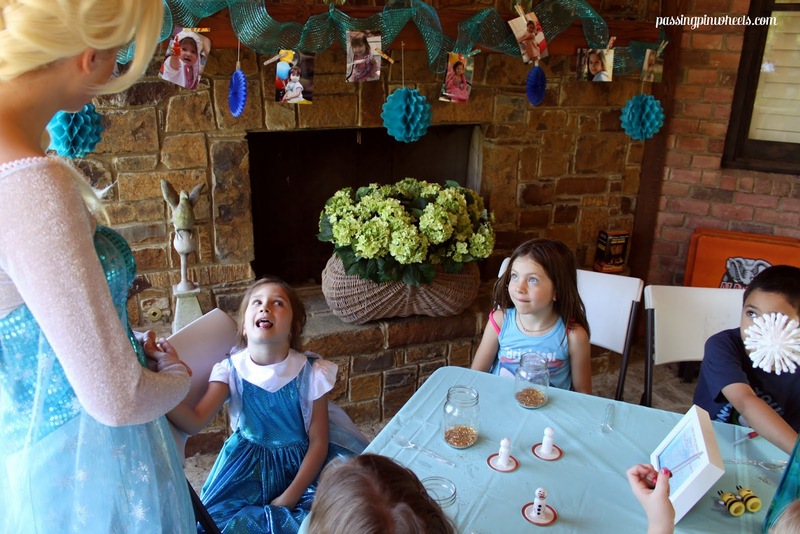 I'm going to do a separate post on this project so let me just say that I could not have done this crazy party without Tamara who helped Elsa become Elsa, Penny my cake cutter, cleaner, and child wrangler, Christy the art project person extraordinaire, and the various parents who helped out! This, by the way, is Autumn monopolizing Elsa's attention. 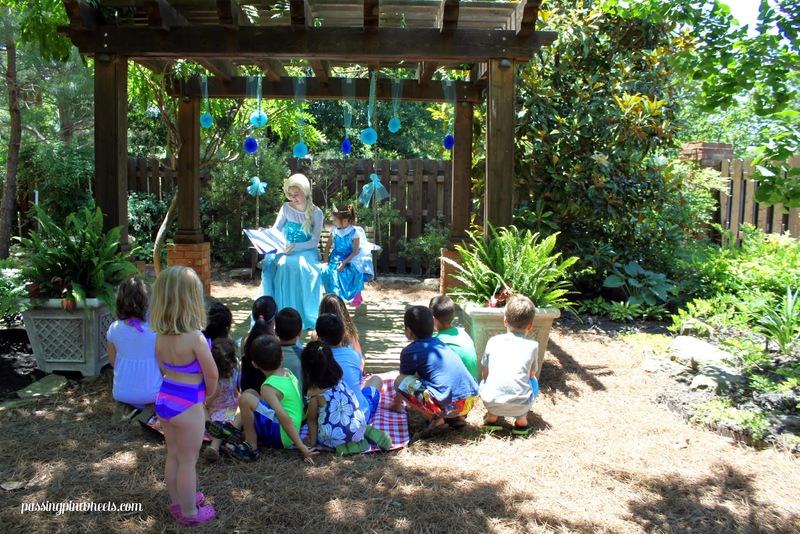 She even read to Elsa while we were passing out cake but I didn't catch that fantastic moment, wah! And some of the grownups! Phew!! Such a long post but so much fun represented here. This was the first party where Autumn pretty much chose the entire guest list and spent a lot of time being a little hostess. We had an incredible turn out and had a blast celebrating together. At the end of the day, we wrapped it up with Parker's Water Ice, something a little different from the usual ice cream and it was great. Which is good because I have about half a tub left. How about we not spam for Jesus.